When you buy a gift card at Starbucks you have the option to place the card directly on your Smart Phone. When you order a pizza online you can track the Pizza’s progress from the oven to your driveway. If you were speaking to Ford’s Vice President of North American Sales Ken Czubay he would tell you Ford is behind on the technology front and they know it. Czubay, whose LinkedIn profile states he is Ford’s “Sales Guy,” is counting on Apple iPads to increase customer engagement. He spoke recently in front of a packed house at Wesley Chapel’s Saddlebrook Resort in Wesley Chapel during Ford’s regional Southeast business meeting. The tablets will be launched in both Sales and Service with a variety of applications targeted at giving customers a greater and more efficient experience. In Service applications will quickly pull up a customers vehicle history and offer an efficient RO build. 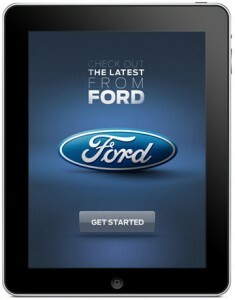 Ford began using tablets and their new “Showcase” application recently through a Dealership opt-in program. The application is an extension of Ford.com allowing vehicles to browse inventory and customize the Ford order of their dreams. Czubay admits that despite Ford’s recent strides they need to become more of a car company being that the opportunity with their best selling F-150 truck is limited. While Ford’s Mike Rowe-lead commercials are favorably received customer loyalty is flat on both of the arena: sales and service. Whether or not tablets become a part of the successful culture of Ford remains to be seen but will in a large part come down to execution. Ford admits that until they find a differentiated customer strategy at the dealership level they will still be haunted by third-party Internet providers like TrueCar that offer and deliver a unique customer experience. Hi there! I will be looking forward to visit your page again and for your other posts as well. Thank you for sharing your thoughts about certified used auto dealer. I am glad to stop by your site and know more about certified used auto dealer. Keep it up! This is a good read. You have such an interesting and informative page. With any certified pre-owned program, it is important to note who does the actual inspection and reconditioning repairs, if any. Both OEM and dealer-certified program vehicles are typically inspected by employees of the selling dealer- not by the manufacturer as may be assumed. Independents may employ a disinterested third-party inspector to ensure objectivity, or may allow the dealer to inspect their own vehicles. Now every Certified Pre-Owned Vehicle from Chevy, Buick and GMC has the value and confidence you need. That’s because every Certified Pre-Owned Vehicle comes with Owner Care, our newest vehicle benefits package, featuring our new, exclusive 2-Year/30,000-Mile Standard CPO Maintenance Plan; a 12-Month/12,000-Mile Bumper-to-Bumper Warranty; and a 5-Year/100,000-Mile Powertrain Limited Warranty. See? We didn’t call it Owner Care for nothing. This is very nice and informative blog thanks for sharing this informationareDealership Loyalty Programfully insured to provide your belongings the extra cushion that they might need during the transit and giving you the peace of mind that your valuable possessions are in good hands.